researchers, and construction and grounds keeping crews among many other things. the 2015 income tax deduction is MIDNIGHT Dec 31, 2015 ! Our A. T. Museum is a FEDERALLY REGISTERED NON-PROFIT . click on the tab "Support", then click the "Donate" button to go to our Pay Pal page. all types of donations this past year ~ artifacts, volunteer work, financial contributions. by VOLUNTEERS through all these years, SO IS ITS MUSEUM, our A. T. Museum, and will be for years to come ! Robert "RED WOLF o'da SMOKY'S"
Last edited by Red Wolf; 12-23-2015 at 15:24. Here are few informative updates I want to pass along for your review. based on one of Grandma Gatewood's sneakers. and gazes upon an iconic sign (a sneaker) tied to a battle for a billionaire's estate. at the heart of history’s most incredible triumphs, sensational crimes and bizarre encounters. by Mary Soderberg, Vice President, Friends Of Pine Grove Furnace. 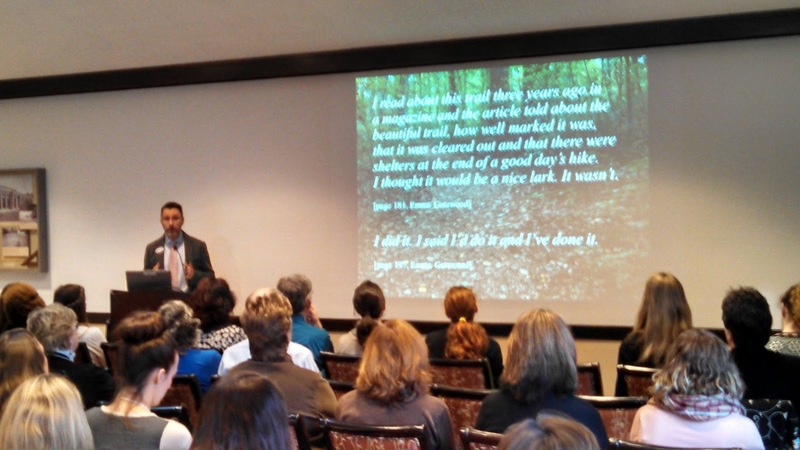 participated in the Appalachian Trail Conservancy Biennial and further embraced our geological and cultural heritage. including many along the IAT route. Your support of our A. T. Museum is appreciated. and expansion into the remainder of the "Old Mill" building ! Begin receiving our important A.T. Museum updates to your email acount ! None the less, we appreciate all contributions which may come in. the remainder of the "Old Mill" building. Last edited by Red Wolf; 12-30-2015 at 16:48. AT HALL OF FAME NOMINATIONS & MORE ! HAPPY & PROSPEROUS 2016 ! and financial supporters for making our Museum the success it is. into the remainder of the "Old Mill" building ! Last edited by Red Wolf; 01-02-2016 at 17:24. A GREAT BLOG POST BOOK REVIEW OF "THRU-" & A DIRECT AT HALL OF FAME NOMINATION LINK ! The Southern Terminus of the AT plaque at the top of Springer Mountain, Georgia ! I hope you enjoy these two photos of the AT's southern terminus area in north Georgia. I wanted to begin this A. T. Museum Update with them to lead into this email's content. our glorious Hike Inn. The Museum is now selling our Captain Stupid T-shirts !" or if you wish to mail in your nomination, you may download a hard-copy form from the "HARD COPY FORM" attachment. go to our website: <www.atmuseum.org>. Last edited by Red Wolf; 03-19-2016 at 13:08. New Film (short) ~ "A Walk......In Bryson's Footsteps on the Appalachian Trail" ! Recently, one of our readers sent me a short film of her 2 weeks "blitzing up the AT" ! share this short film with you, but thought it considerate to seek her permission. the opportunity to speak and have an audience to hear them ! ~ THANK YOU, PHOEBE SMITH." By all means do share it...Phoebe"
~ and with varoius hikers and AT volunteers along the way ! ~ "Woodchuck's" AT Half-Way Marker just south of the A. T. Museum! ~ etc, etc.etc & more ! accepted through FEBRUARY 29 ~ ONLY ABOUT 30 DAYS MORE ! Or for a hard copy form to mail in, click on & print from the first attachment. January 28, 2016 Press release click on the second attachment. South Mountain while enhancing the public's awareness." HOURS ~ PRESENTLY CLOSED FOR THE SEASON; OPEN IN MARCH. May 7 - July 17, Every day ~ 9 am to 4 pm. July 18 - Aug 21, Every day ~ 12 pm to 4 pm. Aug 24 - Oct 30, Wed - Sun ~ 12 pm to 4 pm. Last edited by Red Wolf; 03-19-2016 at 13:09. A Musem musical Flash-Mob ! ~ latest IAT/SIA link ! A MUSEUM MUSICAL FLASH MOB ! ~ & LATEST IAT/SIA NEWS LINK ! featured an original arrangement of "Jesu,Joy of Man's Desiring/Joy to the World,"
​MANY THANKS​ to you who support the A. T. Museum's mission to preserve our AT history. continued expansion into the remainder of the "Old Mill" building ! Your SUPPORT IS APPRECIATED . TRAIL DAYS FESTIVAL ~ DAMASCUS, VA ~ MAY 9 - 15, 2016 ~ LINK ! F.Y.I ~ for your review, here is the Trail Days Festival Schedule Page link. It begins with Saturday May 9th's "Town-wide Garage Sale" and ends Sunday May 15th ! Thursday; Friday; and Saturday are the days of the BIG CROWDS ~ earlier days less so. the actual Trail Days Festival ~ SO, CHECK IT OFTEN FOR DATES & FOR CHANGES ! You may want to click on the other tabs at the top margin of the page for more info. Last edited by Red Wolf; 02-08-2016 at 10:22. Two emails, containing organizational newsletter, just came across to me ! One is the two-page THE FRIENDS OF PINE GROVE FURNACE STATE PARK NEWS. 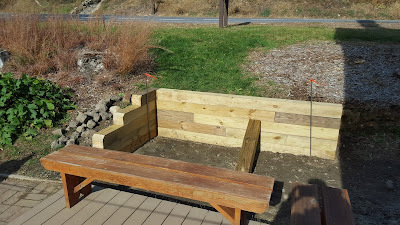 "Welcome Joe Basil, Our New Park Manager",and "GRANT AWARDED TO IMPROVE MOUNTAIN CREEK TRAIL". and the 6th. Annual Iron Race ! besides being absolutely stock full of a wide variety of articles and information. then scroll down and click on the yellow "Donate" button for our Pay Pal page. It begins with Saturday May 9th's "Town-wide Garage Sale"and ends Sunday May 15th ! however, earlier days have no crowds and there are some pleasant activities then also. at the top margin of the page for more info. NEXT MONTH will be the A. T. KICK-OFF Festival (March 4 - 6) ! For more than half of the U.S. population, the Appalachian Trail is less than a day's drive away. Yet despite its proximity to many major cities, few truly know the splendor of this national treasure. by numerous counts of serendipitous grace, and we will never be the same because of it. and others shed light on the complexity of the history and culture of the AT. (if you are already on our email list, it will tell you so and you need do nothing more). Last edited by Red Wolf; 03-19-2016 at 13:10. Clean Up Day - Volunteer Opportunities (Docent Orientation Sessions) - Vol. Picnic ! CLEAN UP DAY ~ DOCENT ORIENTATION SESSIONS ~ VOLUNTEER PICNIC ! 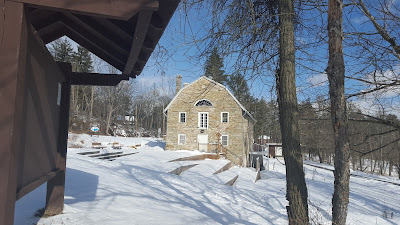 Recent snowy pic of The Museum ~ but warmer days are coming ! DEADLINE SOON FOR NOMINATIONS ! accepted through FEBRUARY 29 ~ ONLY ABOUT TWO WEEKS OFF ! Everyone is permitted ONE NOMINATION online or by paper form. Or for a paper hard copy form, click on FORM. about to expire ! ~ LESS THAN 2 WEEKS REMAIN TO DEADLINE . nature or something fun ! ~ Programs are free and open to the public, Donations are appreciated. ~Children 12 years of age must be accompanied by an adult. on the grounds of The Museum. ~ The Public is encouraged to bring lawn chairs or blankets for seating. ~ Plan to arrive early and ask at The Museum for program location. ~ Programs are subject to change; watch these emails for updates. are being booked now. We hope to offer great stuff throughout the season ! If you have something you would like to present, contact him now! 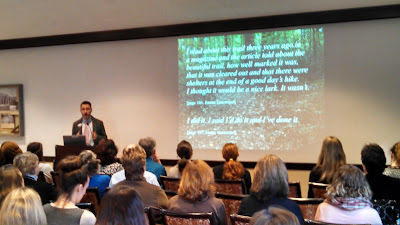 Your topic can be just about anything, relating to the trail, the outdoors, the park, the area, etc. If the program can be held outdoors on our Rampatheater, or down by the picnic tables, all the better. 2016 MUSEUM CLEAN UP DAY ~ MARCH 19th ! will be held March 19th. To see more info, click on CLEAN UP DAY . as well as the Volunteer's Spring Picnic. For more info, click on ORIENTATION SESSIONS. March 26, 2016 - AT Museum opens for the 2016 season ! - and Last Orientation Session . HOURS ~ CLOSED FOR THE SEASON ~ OPEN IN MARCH ! then the "Donate" button to go to our Pay Pal page. and then soon, we will have access to both of the two upper floors ! 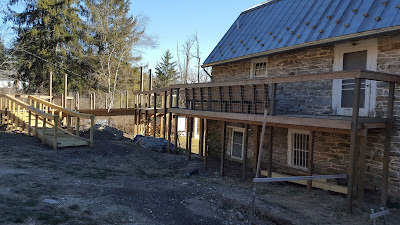 I will try to keep all posted here with photos of the construction . 3 INVITATIONS ~ DEADLINE MONDAY, FEB 29 ~ WOMEN-WALKERS WALK OF FAME ! and Katahdin, Baxter Sate Park, Maine ! The A. T. Museum is a federally registered non-profit. support of our mission by your volunteer efforts and financial contribution . DEADLINE NOMINATIONS IS MONDAY, FEBRUARY 29 ! accepted through FEBRUARY 29 ~ IN ONLY 3 DAYS ! sure your nomination makes the deadline). for this year's AT Hall of Fame . HOURS ~ CLOSED FOR THE SEASON ~ OPEN MARCH 26 ! "We are looking for a few good women ! to do a thru-hike, section hike or flip/flop AT hike, we're looking for you ! We'd like to put together a Women-Walkers Walk of Fame. We'll do the rest. Thanks !" ~ DAMASCUS, VA BRICK BY BRICK PROJECT ! March 26, 2016 ~ AT Museum opens for the 2016 season ! are being booked now and we hope to offer great stuff throughout the season ! be just about anything, relating to the trail, the outdoors, the park, the area, etc. March 19th, 2016 - 9 to Noonish - AT Museum Clean Up Day and Second Orientation Session. March 26, 2016 - Last Orientation and AT Museum opens for the 2016 season ! If you prefer to donate electronically, click on SUPPORT, then the " Donate " button. the Charcoal Challenge 5K have been announced ! Mountain Creek Trail between the park's two lakes ! Help build a stronger A. T. Community in the iconic Trail town of Damascus, VA - brick by brick ! Trail conservancy's Appalachian Trail Community program and the Mount Rogers A. T. Club. or to honor and remember someone. Help build a stronger A. T. Community brick by brick ! Museum Clean Up - A Special Program - State Park Programs - A Mountain Music Treat ! CLEAN UP DAY ~ 2016 MUSEUM SEASON ! ~ SPECIAL PROGRAM ! ~ AND A MOUNTAIN MUSIC TREAT ! ~ our new Serviceberry tree ! THIS SATURDAY, March 19th. is Clean Up Day ! and help us spruce up the joint for next week's opening." Just show up at 9 am to 12 noon ~ any amount of your time is appreciated. to pass along to you. an educational program designed to encourage reading for pleasure and then start a conversation. of the Appalachian Trail in 2013 and went on to complete a thru-hike of the Pacific Crest Trail in 2015.
with all proceeds supporting the Appalachian Trail Museum. Programs are free and open to the public." Note: Presenters are being booked now and we hope to offer great stuff throughout the season ! If you have something you would like to present, contact Joe Harold, Museum Manager now! in The Museum in June 2017 (see form for listing level details). We are a federally registered non-profit, and contributions are tax deductible. If you prefer to donate electronically, click on SUPPORT , then the " Donate " button. A MOUNTAIN MUSIC TREAT ! I hope you enjoy these two links to some most excellent mountain bluegrass music ? towns and even at the general stores in crossroad hamlets all along the AT ! ~ wherever the local musicians can gather with those that enjoy hearing them and their special music. many, in the Southern Appalachians along the AT where one hears this music still being played. This is the music of Lester Flatt and Earl Scruggs as interpreted by the Earls of Leicester. Last edited by Red Wolf; 03-19-2016 at 13:11.
on opening day in June 2010; it is found on page 21 of the Spring 2016 Issue of Earth Heritage Magazine. His letter has the link to this magazine, AND several other interesting links ! ~ Robert "RED WOLF o'da SMOKY'S"
Report: Clean Up Day - Special Sunday Program - Hound Hikes ~ & More ! ~ THE IAT / SIA LETTER ! the A. T. Museum and its grounds for The Museum's 2016 SEASON GRAND OPENING ! in strength when Boy Scout Troop 105 from Saints Philip and James Church, Exton, Penn. came by to help ! They were spending the weekend in the State Park . Every floor of the building received some tender loving care; the transformation in every space was quite evident. as we start to blend the ramp into its surroundings. in the form of fruit, cheeses and meats, deviled eggs, desserts and hot soup ! Many thanks to the suppliers of this delicious nourishment . The rain held off and by Noon, The Museum and grounds were both ready to go. stocked, and awaiting its first official visitors of this 2016 season! ~ submitted by, Joe Harold, Museum Manager "
~ MANY THANKS, Joe ! Your efforts are appreciated ." onSunday, April 3, at2 PMkicking off its 2016SundayProgram Series. completing the trail in one continuous hikewithin one year. went on to complete a thru-hike of the Pacific Crest Trail in 2015.
will be museum board member Gwen Loose. with all proceeds supporting the Appalachian Trail Museum. This and ALL Sunday Programs are free and open to the public. relating to the trail, the outdoors, the park, the area, etc. --> MUSEUM OPENS THIS SATURDAY, MARCH 25 FOR 2016 SEASON ! May 7 -- July 17, Every day ~ 9 am to 4 pm. (open Labor Day and Columbus Day ). Dogs are man's best friend and love to get some exercise too. from March 21 to April 25. The hike, led by the park educator, will start at the Fuller Bath House at 5:15 pm. Along the way, hikers will find out how to keep pets safe when hiking and learn about nature as well. During the program, dogs will be able to socialize and get quality exercise outdoors. Only one dog per hiker. Please wear sturdy shoes and bring water. Dogs must be leashed and friendly with other dogs. No registration is needed for these free programs. For further information, contact the park office at 717-486-7174.
on page 21 of the Spring 2016 Issue of Earth Heritage Magazine. His letter has this link magazine's link, AND several other interesting links ! Last edited by Red Wolf; 03-29-2016 at 15:02. 2016 A. T. Museum Season Began Today ! 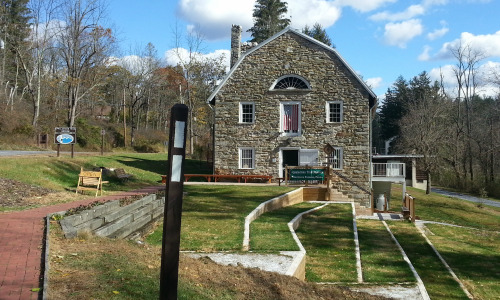 APPALACHIAN TRAIL MUSEUM BEGAN ITS 7th. SEASON TODAY ! into the remainder (the upper two floors) of our "Old Mill" building. 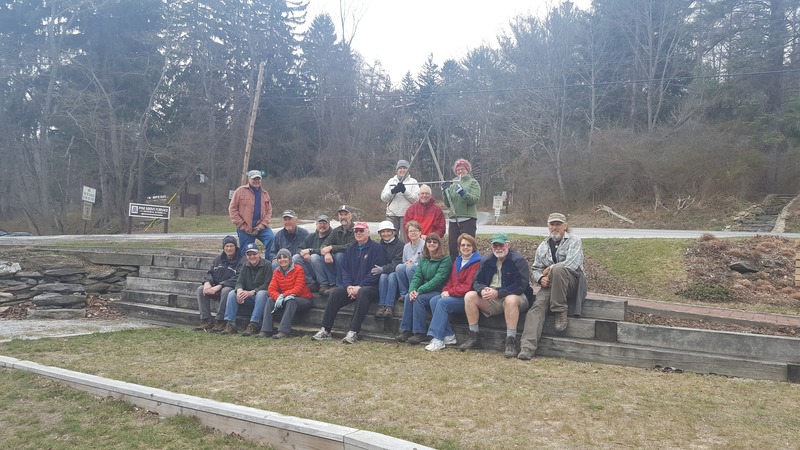 the AT hiking community, and we expect another successful season ! "Thank you for your support . It is appreciated". March 26- May 1, Weekends only ~ 12 pm to 4 pm. This Sunday, a Special Program ~ Hound Hikes ~ An Invitation ~ IAT/SIA Website Link ! The A. T. Museum is now open for the 2016 season ! on Sunday, April 3, at 2 PM kicking off its 2016 Sunday Program Series. of the Pacific Crest Trail in 2015.
of women hikers will be museum board member Gwen Loose. available at The Museum for conversation ! 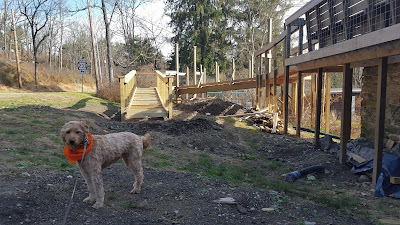 the program, dogs will be able to socialize and get quality exercise outdoors. the an invitation to pass along to all readers. HAPPY TRAILS ! ~ MAYBE SEE YOU THIS WEEKEND AT THE MUSEUM ! Last edited by Red Wolf; 03-30-2016 at 11:24.
within one year. ~ see "postscript" below for her photo and more ! attended the Community Read Kickoff at Longwood Gardens in Kennett Square, PA.
with local libraries and community partners for the Community Read. This program is designed to encourage reading for pleasure and to start a conversation. This year's theme is "one person to inspire many" . Grandma Gatewood's Walk by Ben Montgomery. 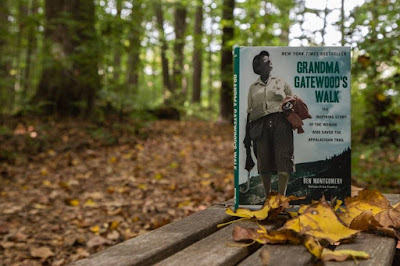 The story of Emma "Grandma" Gatewood, first solo, female thru hiker. Emma is in the Class of 2012 of the Appalachian Trail Hall of Fame inductee and one of our main exhibits at the Museum. HAPPY TRAILS ! ~ HOPE TO SEE YOU THIS SUNDAY ! Last edited by Red Wolf; 03-30-2016 at 11:23. 2016 Board Meeting - Membership Report - Iron Run Trifold ! ~ Iron Run Half Marathon & Charcoal Challenge (June 11) ! South to North ......... 1101.7 m.
North to South ......... 1087.4 m.
~ the mileage markers for the Appalachian Trail Museum from Springer & from Katahdin. So, this year's actual mid-point is at 1094.55 m. or 7.15 miles south of The Museum. (these mileages are from Museum Manager Joe Harold's reading of this year's A. T. C. publication). 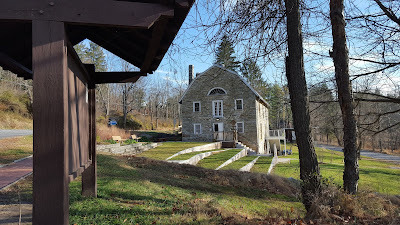 Last Sunday, April 3rd, the Museum board held its first annual meeting in the "Old Mill" ! With heat and air conditioning, the building is now usable year round. We're making progress on renovating the rest of the building. on Saturday, June 4, the day after the AT Hall of Fame Banquet (June 3). Watch for SPECIAL upcoming AT Hall of Fame press release here soon and in the ALDHA Newsletter. Work continues on the upper floors and outside ramp. 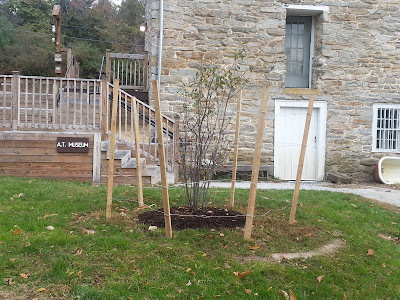 The total memberships in the Appalachian Trail Museum Society presently 454 individuals ! The 2016 contributions are ahead of last year's by $11,090.26 and still continue ! ~ is over original goal of $150,000 by $39,043.06 and contributions continue ! before this year's December 31 DEADLINE expires ! individual emails to a list of 2,837 subscribers ! The past year, this our A. T. Museum Whiteblaze thread had 17,410 visits increase over same 2015 period !